Risk management plays a crucial role in just about every corporate or public sector decision today. That’s why the demand for managers with formal risk management training is escalating—and why now is the time to build your skills in this emerging field. You’ll become a better manager and distinguish yourself among colleagues and competitors. Our program consists of three comprehensive management courses focused on nurturing your ability to analyze and communicate risk, and developing strategies for assessing and addressing loss. All courses are delivered in person to small classes, allowing you to develop a powerful network of peers in an impactful, hands-on learning environment. Our program is one of the quickest paths to professional designation in the country. In under one year, you can complete the required courses and be eligible to take the Global Risk Management Institute’s Canadian Risk Management exams, the country’s leading designation in the field. Whether you seek a professional designation or not, this program will substantially increase your confidence, effectiveness and value to your organization. Our courses are designed to be taken in sequence, building up your core risk management skills logically and effectively. An overview of how to identify, analyze and monitor risk. A prerequisite for the other courses. What causes an accident? What are the best strategies for treating risk? Explore the latest theories and strategies. Learn about the selection, implementation and monitoring of risk financing techniques, including insurance options. Our two seminars are an ideal introduction to the field of risk management. 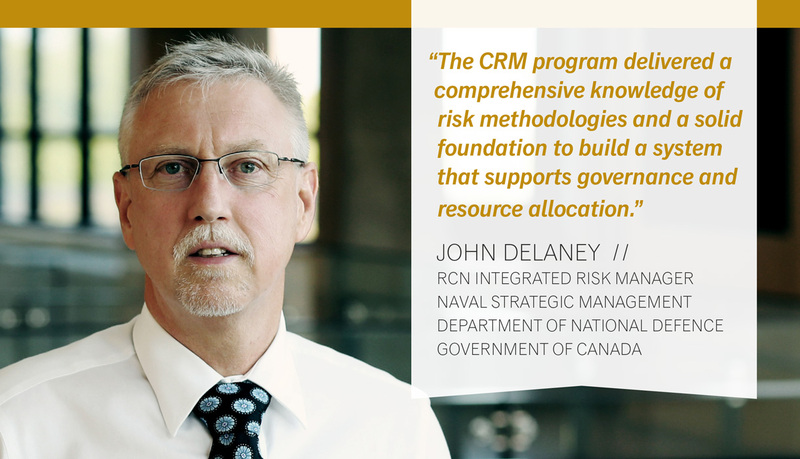 They also provide a solid starting point for those considering the Canadian Risk Management Program. Risk management is crucial to today’s corporate decision-making. Learn the foundational theories, processes and framework. Demystify the world of insurance. Learn to use insurance more strategically and optimize its benefits.